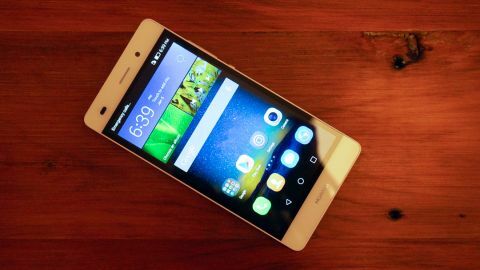 At $249 (£199), the P8 Lite leaves more to be desired with comparatively priced smartphones one-upping Huawei. From the iPhone to a $20 Nokia, every smartphone is made in China. Motorola attempted to bring manufacturing back to the US with the launch of the original Moto X, but that ended up only lasting a year. The inescapable truth is that China keeps costs low, and in the quest for more profits, every little bit counts. A number of Chinese brands have tried making a splash in the US and UK from Lenovo to OnePlus. While it would be great to see Xiaomi finally offer its smartphones and tablets in the West, the saying "If it ain't broke, don't fix it" comes to mind. Huawei, on the other hand, has already broken out of its shell by launching an online store last June, and selling the Ascend Mate 2 to customers in the US. Now, Huawei (pronounced WAH-WAY) is back with the flagship P8, and what we'll be covering in this review, its sibling: the P8 Lite. The P8 Lite has a 5-inch, 720p IPS display, giving it a pixel density of 294 ppi. It's powered by a 1.5 GHz octa-core processor, and 2GB RAM. A standard 16GB of internal storage is inside, and there's microSD card support up to 32GB. On the back is a 13 megapixel (MP) camera and dual LED flash, and on the front is a 5MP camera. Dual SIM card and LTE support offers more freedom, and a 2,200 mAh battery keeps the wheels turning. At first glance, the Huawei P8 Lite looks almost identical to its flagship counterpart. However, coming in at $249 in the US and £199 in the UK, some sacrifices have been made. Gone is the metal body for a plastic faux metal frame, and the screen is slightly smaller at five inches. It's also a bit thicker at 7.7mm, though does weigh about half an ounce less at 4.62 ounces. It's very much a block design with ever so slightly rounded corners, and on the bottom front you have a chrome Huawei logo. On the back, the plastic continues with a brushed look. The 13MP camera and single LED flash sits in the top left corner, and another Huawei logo sits in the center below that. The P8 Lite feels a little on the thick side, but at 4.62 ounces, is very light. From the faux metal frame to brushed plastic back, every angle provides solid grip, and reassurance it won't say hello to concrete anytime soon. If it does, Corning Gorilla Glass 3 should help minimize the damage. On the top is the headphone jack, and on the bottom is the charging port and two speakers. Well, there are two speaker grilles, but the reality is that there's only one speaker, which is on the left-hand side. The power button and volume buttons rest perfectly together on the right-hand side exactly where they should be, and the dual microSIM card slots are located below that. If you want to add a microSD card (up to 32GB), it goes in the first SIM card slot. This means your SIM card will need to rest in the second slot if you plan on adding more storage. There was a time when 720p was great, but that time has long passed. The 5-inch IPS display does a good job, and offers OK color reproduction, but it clearly lacks the pop of a 1080p panel. You can't help but notice individual pixels throughout apps. One could argue the $249 (£199) price point, but that didn't stop Alcatel from packing a 5.5-inch 1080p display in the OneTouch Idol 3. Bezels are to be expected, but a rather thick black bezel wraps around the entire display. Tapping on the display requires a little more force than on other smartphones I've encountered, and I frequently found myself having to double tap for something to happen. This was particularly annoying when typing on the keyboard, and noticing the spacebar never registered after creating a blend of words.